Rancho, a leader in off-road suspension systems for the Jeep market, has announced the release of two new off-road specific, precision engineered Rancho Crawler short-arm suspension systems for the Jeep Wrangler JL Unlimited Rubicon and Unlimited non-Rubicon models. The new Rancho Crawler short-arm 3.5-in. suspension system for Wrangler JL Unlimited Rubicons (Part No. RS66123B) and 4.5-in. 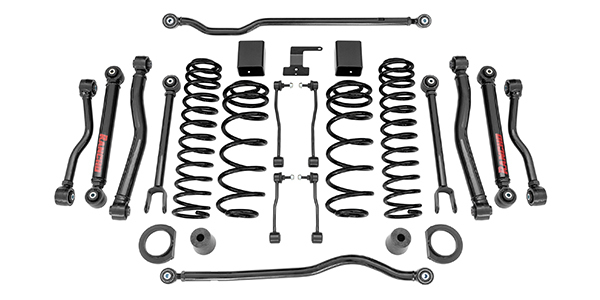 suspension system for Wrangler JL Unlimited non-Rubicons (Part No. RS66125B) deliver enthusiast-driven design enhancements to provide competitive ride performance and vehicle stance. These systems are designed and engineered to be complaint with the U.S. Federal Motor Vehicle Safety Standard No. 126 – Electronic Stability Control Systems (FMVSS-126). The new Rancho Crawler short-arm kits for the Jeep JL Unlimited Rubicon and Unlimited non-Rubicon models include progressive rate coil springs and adjustable Rancho control arms with new Rancho D2 synthetic high articulation bushings to deliver superior dampening, improved ride/handling characteristics and no maintenance. These systems also feature D2 bushings inside the heavy-duty front and rear track bars to easily center the axles. The systems were designed for convenience after installation and allow for caster and pinion angle adjustments while installed. Each system is compatible with an array of Rancho performance shock absorbers, including regular and extended length Rancho RS5000X and RS9000XL units, that are available for purchase separately. The JL-specific RS5000X and RS9000XL shocks also include an exclusive, innovative new shock technology, Dynamic Rebound Spring (DRS) technology. DRS technology includes a unique internal system that has a precisely tuned metal spring and fortified interior construction to improve control, reduce vehicle body roll and prevent rod overextension. 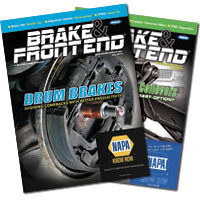 “Jeep owners looking for an off-road performance suspension system want to be able to fully customize their experience. By offering RS5000X and RS9000XL shocks in regular and extended length designs, we’re giving enthusiasts the opportunity to dial in the system specific to their use, ride preference and appearance,” said Mike Sype, product and marketing manager, Rancho. The Rancho kits were designed for full compatibility with the Jeep Electronic Stability Control System. The systems fit up to an 37-in. tire. Each system includes highly detailed, full-color, step-by-step Rancho installation guides. An aftermarket driveshaft is required for this kit to achieve maximum front articulation. The Rancho Crawler kits, along with the included RS5000X or RS9000XL shock absorbers, are backed by Rancho’s Limited Lifetime Warranty. Rancho RS5000X and RS9000XL shocks also are covered by a 90-day, risk-free offer, which allows consumers to try certain dampers on any truck or SUV for 90 days. Consumers can return their shocks within 90 days for a full refund of the product’s purchase price. To learn more about these warranties and offers, visit GoRancho.com. Rancho is headquartered in Long Beach, Calif., and is manufactured and marketed by Tenneco. To learn more about Rancho products, contact your nearest Rancho dealer, call 734-384-7806 or visit GoRancho.com. Connect with Rancho on Facebook, Twitter and Instagram.